We’re grateful to have the opportunity to work with youth engagement CIC [email protected] (www.kickoffat3.co.uk) and Herts Constabulary to bring together to local community. We are arranging a football tournament to engage the local youth and promote positive choices and mental health. 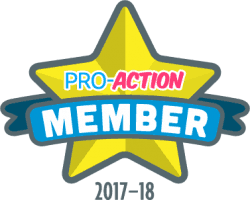 Created by Michael Wallace and Ashley Levien, [email protected] is an initiative focused on improving engagement between the police and the local youth. Michael is a serving Police Officer working in Youth Engagement and is passionate about supporting youth and community initiatives outside work too. He understands how important connection and relationships are with vulnerable young people, sports can provide stability they might not get elsewhere. 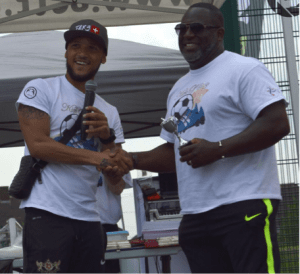 Ashley runs social inclusion initiatives and a Soccer School in the London Borough of Barnet. 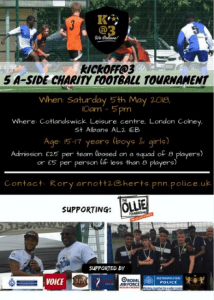 The tournament is being held at London Colney Cotlandswick Leisure Centre on May 5th and is open to all the community. There will be live music, dance and presentations from relevant figures and charities. A community meeting was arranged for April 16th where members of the local community were invited to come along and find out how they can get involved. There were representatives from [email protected], OLLIE and Herts Constabulary present to ask local people for their thoughts about how to improve the day and ensure it reaches the wider community. If you would like to get involved contact Rory Arnott, Verity or The OLLIE Foundation’s social media accounts.